Who will be managing the server? Depending on the hosting provider, the level of involvement required from your end in the day-to-day operation of the server will vary greatly. This differs from Shared Hosting where the provider is responsible for the maintenance, security and optimisation of the server. Typically, IaaS (Infrastructure as a Service) providers will provide availability guarantees for access to the server at an operating system level and no more. Access can be interpreted in many different ways and the only way to be sure of what this means for your provider is to review the SLA (Service Level Agreement). Common examples of availability are the ability to connect remotely via Remote Desktop (Windows Servers) or SSH (Linux Servers). 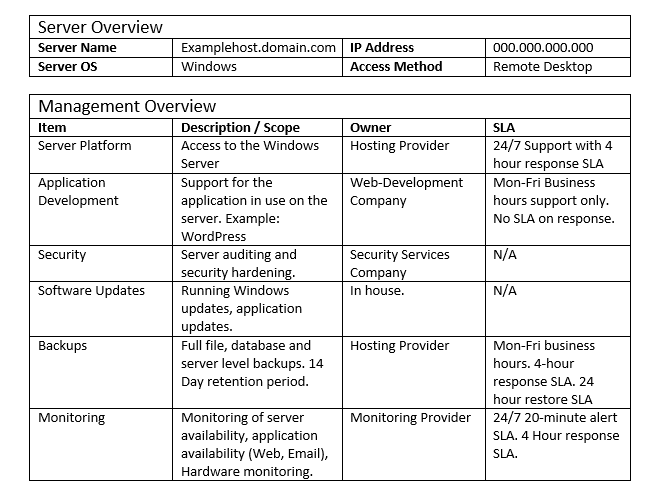 IaaS providers may offer a management package which pushes some of the management responsibilities back to the provider. The most common examples are Managed Backup, Monitoring Services, and Firewall Services. Unless you have a managed service agreement with your provider, you will be responsible for the ongoing maintenance, security and optimisation of the server. If you do not have expertise in this area, outsourcing this to your provider (if they offer management services) or a third party is essential. Just like ongoing maintenance is required to ensure your car does not break down, maintenance for your server is required to ensure you don’t run into issues. Having visibility on the key aspects of server maintenance and assigning responsibility is the first step. Once this is done, you will be able to define and schedule your maintenance plan in advance, ensuring you get the most out of your server and reducing risk of unexpected outages, unplanned business impact and data loss. Next week we will look at server performance and how to work out what server resources you require for your application/website/service and how to monitor their usage.